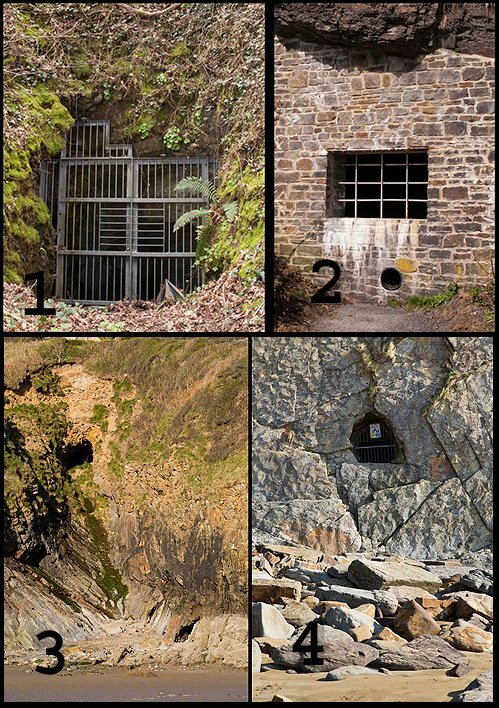 1 - A Gated Coal Mine Shaft near the Coast path - Rhode Wood - Saundersfoot. 2 - A Barred Horizontal Level (Adit) - drainage for Iron Ore workings? - one of two , on the Coast Path between Wiseman's Bridge and Coppet Hall. An adit is a tunnel, sloping slightly upwards to drain the water away and bring out the ore .
3 - At Little Haven , a Mining Ventilation Shaft ? In the southern side of a huge Anticlinal Structure (with Fox Hole Cave at its western end ). 4 - A Gated Horizontal Level (Adit) , for drainage and ventilation of the inland Anthracite workings , in the northern side of the same Anticline Structure as no.3 at Little Haven.